With the new national curriculum, GCSE and A levels, and the demand from universities and employers for resourceful and independent problem solvers, developing our students' problem solving skills is more important than ever. (nrich.maths.org), share some new resources, and consider teaching strategies that allow us to embed problem solving into a busy curriculum. Alison and Charlie have been thinking a lot about resilience since attending a symposium led by Clare Lee and Sue Johnston-Wilder. This led to a presentation at the 2017 Mathematical Resilience Conference, where we began to explore ways of scaffolding NRICH resources. Our Being Resilient collection emerged from the discussions that followed. Clare and Sue have since contributed an article to our Spring 2018 NRICH Secondary feature Resilience and the Growth Zone. 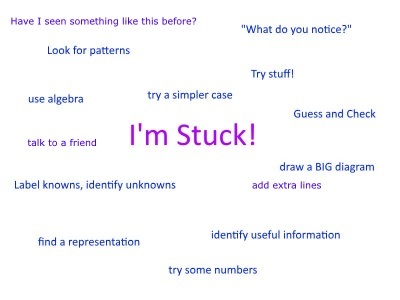 We then collected together everyone's different strategies from when they got stuck, and made a "I'm Stuck!" poster. What did it feel like to do a problem with the scaffolding? Did you feel a sense of achievement? Did the scaffolding take the fun away? Low-achieving students deserve the chance to work mathematically - being a mathematician should be an experience everyone can have. What might we need to do differently to enable them to do so? These problems are ideal for consolidating and assessing subject knowledge, mathematical thinking and problem-solving skills.